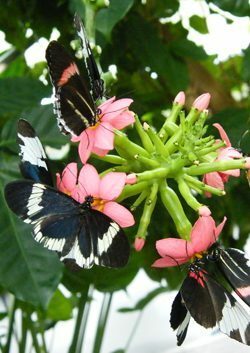 The longwing butterflies, several species of Heliconius, are all brightly patterned in patches and stripes of yellow, red, orange, white, and/or blue on a black background, and have narrow, elongated wings. Their slow, lazy, fluttering flight is designed to show off their bright colors, signaling to predators that they are bad-tasting and should be avoided. These butterflies have several interesting behaviors. For example, they eat pollen in addition to nectar, and they sleep in groups at night, perching on thin, hanging twigs.